Earlier this year I attended my first SourceCon. I flew to Vegas, alone, to find out what everyone over there was doing. Going to a conference alone, on the other side of the world is quite exciting. I didn’t know anyone. I’m an extrovert, so I wasn’t worried about talking to people who I don’t know, but still, you never know how things are going to work out. But going to SourceCon Vegas, was one of the best things I did. 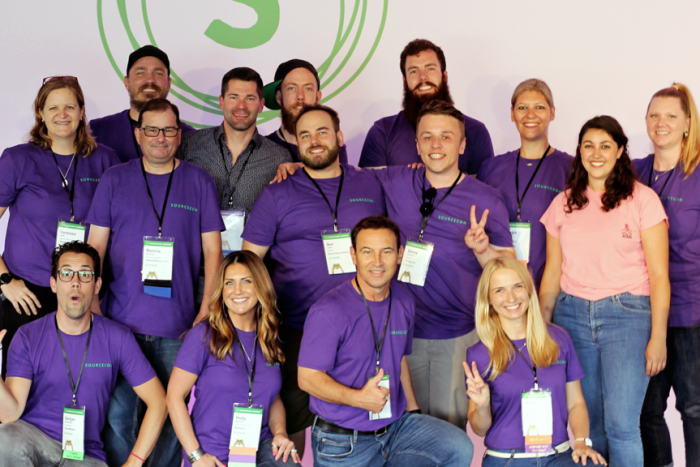 Next, to learning amazing new things, meeting people I have been looking up too since I started in recruitment (#fangirl), there was one other thing that made attending SourceCon great: The Community. I have never felt so welcome at a conference as I felt at SourceCon. On the first night (two days before SourceCon started) I met Mike Chuidian, who was part of the welcome wagon and he did an amazing job at making me feel welcome. He showed me around and told me everything about what to expect. Next, to Mike, I met a lot of other great people, every single one of them made sure that I felt welcome and that I had a great conference. People like Mike and Natalie Glick (my staying-at-the-same-hotel-conference-friend) are the reason that I asked Shannon Pritchett to be on the Welcome Wagon at the conference in Europe. I wanted to make the people who attended in Europe to feel just as welcome as I felt in Vegas. They say that what happens in Vegas, stays in Vegas. I can tell you that is not the case with the SourceCon vibes I got from Vegas: the community in Europe is at least just as amazing and welcoming as in the US. The conference theme in Europe was Family. But when you have a conference with people from 34 different countries (all over the world) how close can you get to make it “feel like a family reunion of brothers and sisters you’ve never met?” Considering that most countries in Europe have their language and cultural differences I was a bit skeptical if it would be as successful as the edition I attended in Vegas. I am happy to say that my skepticism was proven wrong! The way that SourceCon is organized is really good. The ERE staff sure know how to organize a great event, and they make sure that every single detail is perfect (breakfast, lunch, snacks & lots of goodies). But this conference wouldn’t be half as good without the people who attended. It is the community that makes SourceCon amazing. And that community doesn’t care about borders or oceans, they all came to Budapest because of the thing that they love to do: Sourcing! The fun thing is that if you run a random SourceCon Europe search on Twitter or Linkedin, you’ll find words like family, friends, people, and community. By now you get my point: the community is awesome, I’m a fangirl. So, let’s get to what it is that you all are really interested in, CONTENT! Instead of writing an overview of everything that happened I decided to just share with you what actually happened. Because that’s what it’s all about, right? Sharing the good stuff! Special shout out to Jim Stroud, who had his arm up livestreaming (almost) the whole conference! Make sure to also read Guillaume’s recap of the conference too! I’m sure there are other streams, please share them in the comments below if you have one :). After watching all of this, you might think that you’ll have a better idea of what happened at SourceCon Europe. You are wrong! While all these talks are insightful and will probably teach you a bunch of new stuff, you missed the cool stuff. Which happened off the stage, where people would sit together and hack some cool tricks together, share sourcing best practices and most importantly accept and support each other. And that is what community is all about: being together with people who are passionate about the thing they do: sourcing.